Dog Bites: Is Your Landlord Liable in Florida? 767.04 Dog owner’s liability for damages to persons bitten. The owner of any dog that bites any person while such person is on or in a public place, or lawfully on or in a private place, including the property of the owner of the dog, is liable for damages suffered by persons bitten, regardless of the former viciousness of the dog or the owners’ knowledge of such viciousness. However, any negligence on the part of the person bitten that is a proximate cause of the biting incident reduces the liability of the owner of the dog by the percentage that the bitten person’s negligence contributed to the biting incident. A person is lawfully upon private property of such owner within the meaning of this act when the person is on such property in the performance of any duty imposed upon him or her by the laws of this state or by the laws or postal regulations of the United States, or when the person is on such property upon invitation, expressed or implied, of the owner. However, the owner is not liable, except as to a person under the age of 6, or unless the damages are proximately caused by a negligent act or omission of the owner, if at the time of any such injury the owner had displayed in a prominent place on his or her premises a sign easily readable including the words “Bad Dog.” The remedy provided by this section is in addition to and cumulative with any other remedy provided by statute or common law. Can A Florida Landlord Be Held Liable For A Tenant’s Dog? Under the law, it is clear that dog owners can be held liable for injuries caused by their dogs to others – but what happens when the dog owner is a tenant in a single family residence, condo, or an apartment building? In those situations can the landlord be held liable as well for injuries sustained in a dog bite? What about when the landlord received notice that a tenant has a vicious dog and did nothing, or when the landlady knows that a fence is not repaired which allows a dog to get out? Is the landlord responsible here? That’s a pretty broad definition. So broad, that there have been instances where the landlord who has leased to someone with a dog ends up being held legally liable for the injuries caused by the tenant’s animal. What Kind Of Compensation Can A Dog Bite Victim Recover? Additionally, a victim may even recover compensation for lost wages and/or future wages if he or she suffers a permanent injury that prohibits the victim from working. According to Florida Statute 95.11, a victim of a dog bite has four (4) years to file a lawsuit from the date the bite occurred. When Will A Landlord Be Considered An “Owner” Of A Dog Under Florida Law For Purposes Of Imposing Liability On The Landlord? 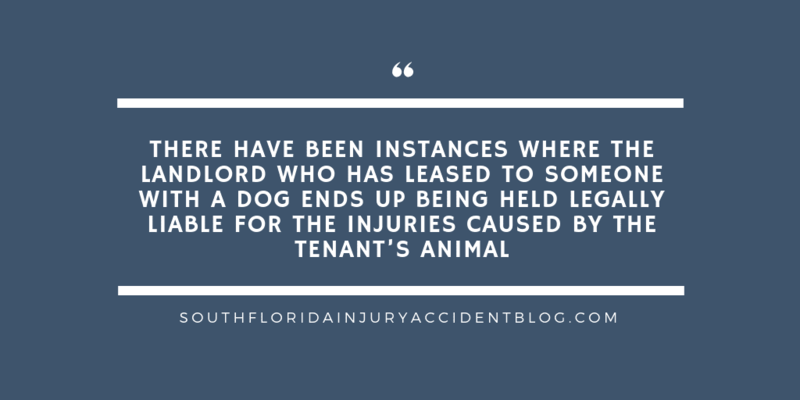 In Florida, a landlord will be liable for dog bite injuries by a tenant’s dog when that landlord is shown by admissible evidence to have known that the dog was vicious, or had the propensity to be vicious and dangerous, and thereafter did nothing to enforce protections against these types of dangerous animals contained within the lease agreement. However, a landlord may be able to escape financial liability for dog bite injuries caused by a tenant’s dog if the landlord can prove that he or she didn’t know about the dog; he or she didn’t know the dog was or could be dangerous; or that the injured person is at fault in some way. When the person who is bitten was partially at fault, this is referred to as contributory negligence. For example, if there is a “Caution: Bad Dog” sign on the property, and the victim enters the property anyway, he or she may have contributed to the incident. In this case, a percentage of comparative fault would be administered when deciding the amount of damages to award the victim. The good news is that an experienced personal injury lawyer can make it very difficult for a landlord to escape liability using these arguments. A good piece of advice if you have been bitten by a dog and believe the landlord is partially liable, is to speak with an experienced personal injury lawyer before you file a claim to learn about some of the issues that can arise with these claims, including the type of evidence needed to prove a claim and the type and amount of damages you can recover. Most personal injury lawyers, like Alan Sackrin, will offer a free initial consultation (over the phone or in person) to answer your questions. What Are The Duties That a Florida Landlord Has To Its Residential Tenants and Their Guests? See – 5 Things You Get From Alan Sackrin and How They Can Help You! I rent a pool home behind my landlords property….